Today we welcome a new contributor to Rewards Canada, Jeff W.! Jeff has been a long time reader of Rewards Canada and we've had lots of discussions with him via email and Twitter as he is always looking to maximize his credit card, travel and other loyalty program rewards! This is his first post of several that will look at how he utilizes the Scotiabank Gold American Express card! Hey fellow Rewards Canada Readers. I’ve always been intrigued by rewards credit cards, as well as travel and other loyalty programs. We’re a family of four, with two young kids, I’d say with an average family income. We love to travel and take our kids on experiences as often as we can as I think family vacations can be very educational. Normally we’ll do a few weekend road trips per year, a week or two summer vacation, and then a winter tropical vacation every two years, for a couple weeks. The entertainment portion of the 4% multiplier is where we earn the most points. 37% of our points earnings since signing up for this card in January of 2017 is in this category. One area where we earn lots of entertainment points is at the movies. With having two kids we love movie days, as well as date nights at the movie theatre (VIP Theatres are great!). We rack up the SCENE points when purchasing our movie tickets, food, and drinks. Once you have accumulated 1,000 SCENE points you can then transfer them over to your Scotia Rewards account. 1,000 scene points will give you 950 Scotia Rewards points, which equates to $9.50 in travel rewards. You might ask why not keep the SCENE points and redeem them for free movies. Well, we prefer to pay for our movies to get the 4% benefit, and have the added benefit which I consider bonus points in the transfer for SCENE points to Scotia Rewards points. Another way we maximize our 4% entertainment return is with our Winnipeg Jets Season tickets. Last year with our regular season payment, we earned $278 in travel, simply with that one purchase. Plus, keep in mind playoff ticket purchases simply add onto that number as well. 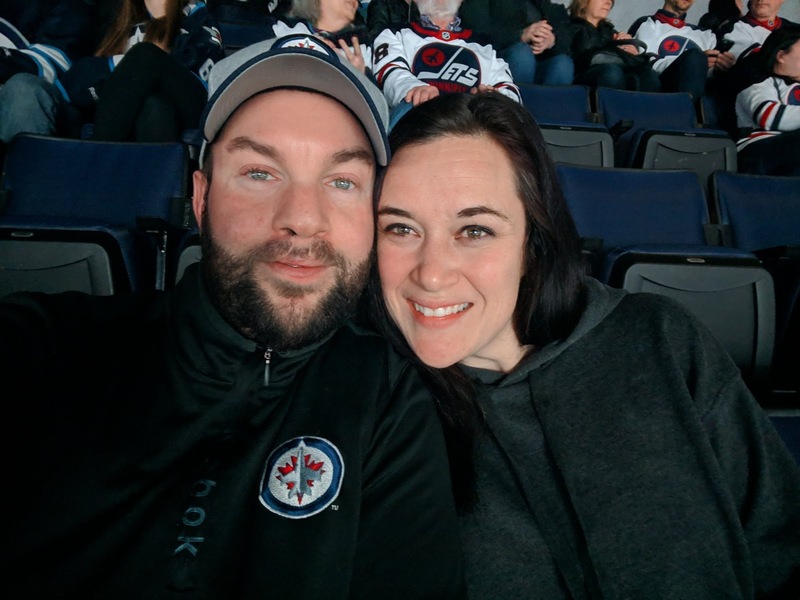 We are a sports family, whether that’s the Jets in the winter time, or the Winnipeg Goldeyes, or Winnipeg Blue Bombers in the summer time, those tickets all bring us a 4% return. Like going to concerts? Yup, that’s another 4% return. Jeff and his wife at a Jets game - paid for with the Scotiabank Gold Amex Card! One of the great or not so great benefits, depending on how you look at it, is what do most people do before or after an entertainment event? They eat…or drink…or both. Yes, dining also gives you a 4% return on your purchases. It’s not surprising that since we started using our Scotiabank Gold Amex, 26% of our spending has been on dining. As long as the restaurant or bar is classified as dining with Amex you get your 4% return. That includes most mall restaurants, McDonalds, Burger king, Starbucks, and full-service restaurant. So if you decide to hit up a restaurant before the Jets game, then attend the game, and go out for drinks after, you’re earning 4% back towards travel that entire night. In the approximately 25 months since having this card…again with only modest spending habits, we are averaging almost $100 a month in travel. Combine this with a modest annual fee of $99 for your first card, and $29 for supplemental cards, it’s a great value. The added benefit of how flexible this card is, you can book your travel as you see fit, charge it on your card, and then use your points for a statement credit. You’ll receive a slight discount on your travel too, as you’ll earn 1% back for your travel purchase. Oh and if you do decide to travel, and fly with WestJet, if you book your flight through the Scotia Rewards website, you can receive up to a 5% discount of your base fares. This is a nice perk which isn’t typically discussed as one of the card perks. How about you? Do you have the Scotiabank Gold American Express Card? How do you maximize your points earning from the card? Tell us in the comments section below!